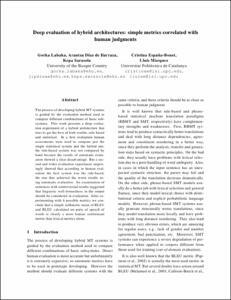 Labaka, G.; Sarasola, K.; Díaz de Ilarraza, A.; España-Bonet, C.; Marquez, L.
The process of developing hybrid MT systems is guided by the evaluation method used to compare different combinations of basic subsystems. This work presents a deep evaluation experiment of a hybrid architecture that tries to get the best of both worlds, rule-based and statistical. In a first evaluation human assessments were used to compare just the single statistical system and the hybrid one, the rule-based system was not compared by hand because the results of automatic evaluation showed a clear disadvantage. But a second and wider evaluation experiment surprisingly showed that according to human evaluation the best system was the rule-based, the one that achieved the worst results using automatic evaluation. An examination of sentences with controversial results suggested that linguistic well-formedness in the output should be considered in evaluation. After experimenting with 6 possible metrics we conclude that a simple arithmetic mean of BLEU and BLEU calculated on parts of speech of words is clearly a more human conformant metric than lexical metrics alone. Labaka, G. [et al.]. Deep evaluation of hybrid architectures: simple metrics correlated with human judgments. A: International Workshop on Using Linguistic Information for Hybrid Machine Translation. "LIHMT 2011 Sponsors International Workshop on Using Linguistic Information for Hybrid Machine Translation". Barcelona: 2011, p. 50-57.